In the fifth instalment of our Ely Hospital series, Clare Hutchinson looks at some of the shocking stories of abuse against patients – and hears from former staff members about their experiences at the institution for people with learning disabilities. Its imposing walls stood for more than 100 years. Yet few knew what was happening behind those walls which enclosed Ely Hospital. The hospital, off what is now Cowbridge Road West, was a familiar sight. 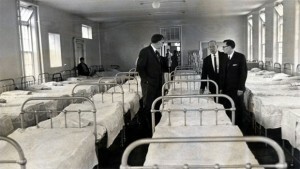 But in 1967 that all changed when a national newspaper printed allegations, made by a whistleblower, of endemic maltreatment of patients – including cruelty, verbal abuse, beatings, stealing of food, clothes and other items, indifference to complaints, lack of medical care and medication used to sedate patients. “We must never forget,” said one former resident who lived in the hospital for most of her life. Labour AM for Cardiff West and Cardiff University professor Mark Drakeford, an expert on the Ely Inquiry, said the allegations only centred on a small minority of staff. He said: “The staff at Ely were not bad people, but somewhere along the way they became part of a system that was. In a video interview recorded for the Ely Hospital project, one former patient – known only as John – recalled his own experience of abuse at the hands of a male staff member. “My mam came to visit me at the ward and there was a nasty fella in there,” he said. “He said to me, ‘You’re not to go home.’ I asked why and he wouldn’t tell me. He had me on the floor, beating me up and was kicking me about like a football. Doreen Jones, a former cleaner at the hospital who contributed to the Ely Hospital project at the Cardiff Story Museum, started there shortly after the 1969 Ely Inquiry. “What sticks in my memory are the padded cells and the Victorian feel to the hospital,” she said. “So many things seemed to belong to the past – even the way the children were dressed, especially the boots they wore. “The hospital is gone now and children from those backgrounds are much better off today. They are dressed like other kids and go on holidays and things, which is great. “I felt that the hospital worked well when there were matrons there – they looked after us and I enjoyed the feeling of being part of a big family. When I left I was sad to go. One staff member, who wished to remain anonymous, said the hospital was a “community within a community”. Martin James, who worked for the Welsh Office and helped close Ely Hospital in 1997, said: “Surprisingly, a lot of parents at the time didn’t like what they saw as a move away from the ‘safety’ of the hospitals, and they resisted the idea.